Have you seen Annabelle? Well Meet Cyril!! After looking for a while for additional material for some of the talks I do, I finally managed to secure something ideal. 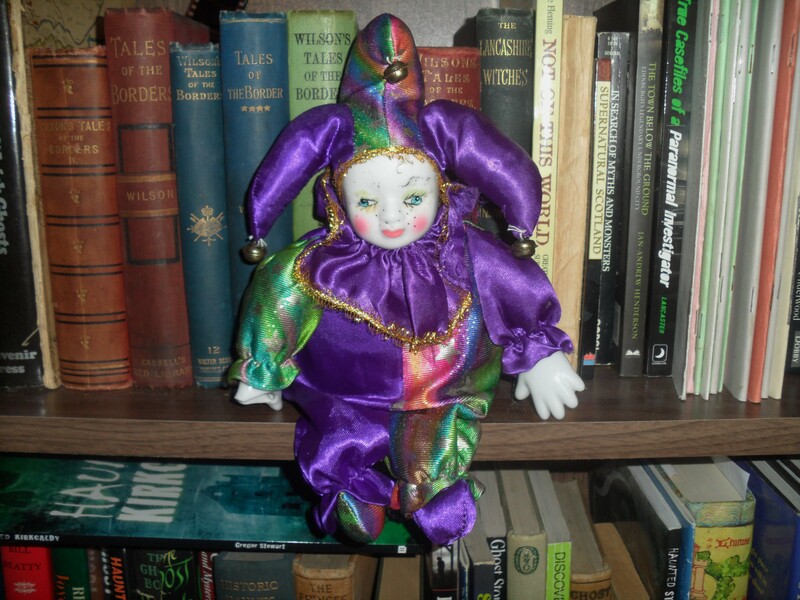 A small porcelain jester or clown doll, named Cyril, or more correctly, a doll that is said to be the host of the ghost of Cyril. I have been wary about the numerous ‘Haunted Dolls’ that are put up on offer. I didn’t want one that was simply said to be haunted, I wanted one which had some form of detail as to who haunts it, and some form of evidence. Having missed out on one, I found Cyril, and he ‘felt’ right, which was odd as I don’t generally like dolls or clowns! After discussing the details with his owner, a member of the circle of professional clairvoyants, I managed to secure him. The information I was provided was that Cyril had come from a deceased estate. He had been passed to the grand-daughter, but she was uncomfortable with the doll and felt he was laughing at her. He was then passed to the member of the circle of professional clairvoyants, who studied him for 6 months. During that time, it is said he was found to move, laugh and release an odour. The name Cyril was given, and that in life he had been a drayman, a driver of a flat bed wagon pulled by horses. This would fit in as the house he came from was a converted coach house. Cyril is said to have stated he was under 40 when he died, and he has been attached the doll for a ‘long time’. The doll itself certainly appears very old. His spirit was felt to be very angry and bitter, although the reason for this is not yet known. I have only had Cyril for a short time, but he so far indicted that there is indeed something odd happening with him. 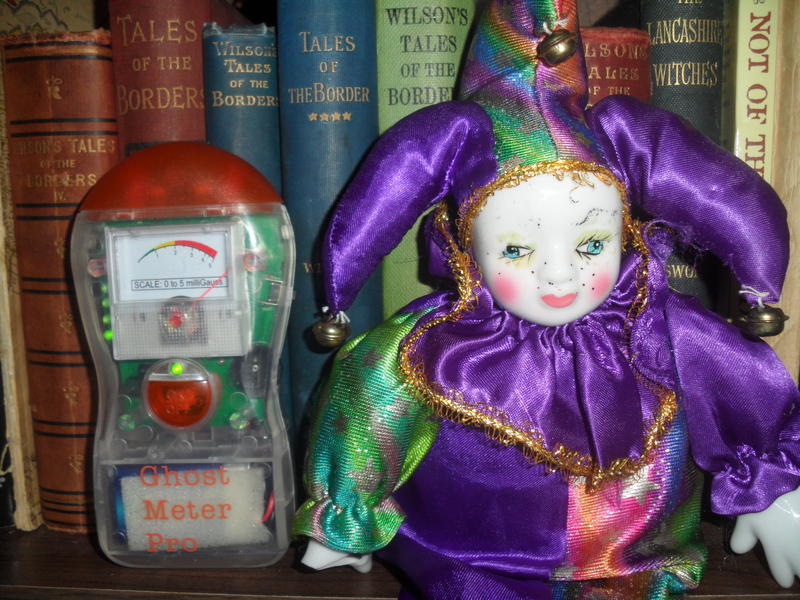 He is kept under glass but the first time I took him out during a talk, within 5 minutes the EMF meter, which was sitting beside him, activated. I had placed the meter beside him in a pile of books, and nothing had been moved. After a minute or so the meter went back to normal readings, but activated again several more times, frequently peaking at the maximum reading. This was witnessed by the audience. I have since repeated the experiment in private and again the meter activated and peaked. The above photograph shows the meter as ‘off the scale’. I have also tried using the meter on communication mode, and it has indicated a yes answer to the question of whether he worked with horses and whether he is angry. Interestingly though it indicated no to the question whether his name was Cyril. I tried the question a few times, varying between asking for one or two flashes of the light for yes, and every time it answered ‘no’. I tried an EVP session, but nothing was detected.